Search Module is a malicious browser hijacker, and it can replace the search tools of the installed browsers without any permission. So far our researchers have discovered that the infection is targeted at the popular IE, Firefox, and Chrome browsers; however, it may be just a matter of time before the threat affects other systems as well. Ironically, the obvious changes to your browsers area good thing because this is what will help you recognize the existence of malware that requires removal. Do you know how to remove Search Module? Even though Search Module silently travels bundled with ShopperPro, YoutubeDownloader, Tuvaro Toolbar, iWebar, and other questionable software promoted by third parties, you will find out about its existence as soon as the hijacker takes over the browsers. The devious Search Module hijacker can take over the default search provider and the home page of the browsers. Luckily, the infection replaces the default search provider settings to bing.com – a widely-used and well-liked search tool. Of course, this does not mean that you should postpone Search Module removal for any longer. In fact, you must delete the hijacker ASAP! Once installed, Search Module hijacker adds a shortcut to the Taskbar of the Windows operating system. If you click this shortcut, you will launch Internet Explorer and activate a connection to www-search.net. 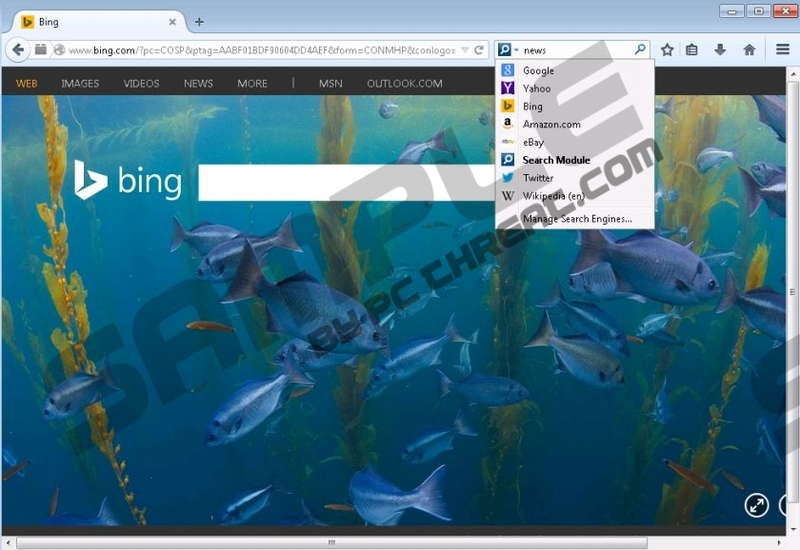 Before the page loads up, you will be redirected to bing.com, and a seemingly reliable search engine will show up. Due to the abruptness of the webpage redirecting, users often do not recognize illegal activity and do not rush to delete Search Module hijacker; however, you will disable the suspicious activity only if you delete the hijacker from the operating system. As mentioned before, Search Module travels bundled with third-party software, and, according to the recent research, many of the additionally bundled programs are related to adware helpers. It is possible that besides Search Module removal you mayalso need to worry about the removal of adware helpers that may be capable of silent software updating, data collection,and other similar intrusive operations. Note that in most cases the hijacker comes packaged with Goobzo (C:\Program Files\Common Files\Goobzo\GBUpdate),which requires removal as well. Even though Search Module can modify search settings and even corrupt the browser shortcut Target, there is a way to fix all of the issues related to the hijacker. First of all, you need to follow the instructions below and delete Search Module from the computer. Afterwards, you must restore your browser settings (see the manual removal guide below). Lastly, you should install authentic security software to remove remaining threats automatically. Click Start on the Task Bar and open the Control Panel. Double-click Add or Remove Programs and the Change or Remove Programs list will show up. Choose the program you wish to get rid of, click it once and select Remove. Navigate to the Task Bar and click the Start/Windows icon on the left. In the menu that appears, click Control Panel and then select Uninstall a program. Now right-click the application you wish to delete from the system and select Uninstall. Right-click on the screen of the Metro UI menu and select All apps (Apps menu). Now click Control Panel to access a different menu and select Uninstall a program. Choose the application you wish to delete, right-click it, and choose the option Uninstall. Open the browser, while simultaneously tapping Alt+T (Tools) and selecting Manage Add-ons. In the menu on the left select Search Providers and add a new default search tool. Simultaneously tap Alt+T to open the Tools menu again and click Internet Options. Click the General tab and navigate to the Home Page box. Overwrite/remove the URL of the undesirable search provider and click OK.
Open the browser and navigate to the Firefox search box on the right of the page. Click the search provider icon to open a menu and select Manage Search Engines. Simultaneously tap Alt+T to open the Tools menu and choose Options. Click the General tab, overwrite/remove the Home Page URL, and click OK.
Open the browser, simultaneously tap Alt+F, and select Settings. Go to the On Startup section and mark Open a specific page or set of pages. Click Set pages and locate the URL representing the undesirable search provider. Click Change and again follow step 4 to remove the unwanted search tool. Finally go to Search, click the Manage search engines button, and add a new default search provider. To remove the undesirable search tool, click X on its URL and select Done. Quick & tested solution for Search Module removal.